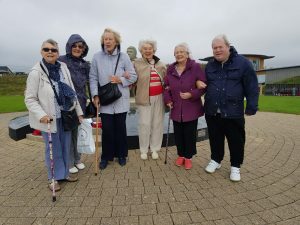 On a very blustery Wednesday a group of residents set off on a trip to Folkestone. We were lunching at the Grand Hotel on the Victorian “Leas” but first we visited the Battle of Britain Memorial perched along the white cliffs on the Dover Road. This was a wonderful place to wander around workhorses of WW2; The Spitfire and The Hurricane. One could almost imagine them taking off from the cliff top and flying into the distance across the sea towards France. Unfortunately we could not see across to France due to the weather. After coffee we boarded the coach and headed towards Folkestone town. The dining room was certainly grand with large crystal chandeliers sparkling down onto white table linen. After lunch some of us braved the elements and were blown along the promenade, enjoying the sea air. We were looked after so well by the staff of the hotel and the cheerful coach driver. A truly lovely day out.